The I-League is finally back after all the drama which saw teams pulling out at the last moment, new teams being drafted in and even the existence and priority of the league being put into doubt. Its the time of the year when the long serving fans of Indian Football rejoice and flock the stadium with banners and posters, chanting slogans for their favorite teams. Its time for Hero I-League 2016-17 to kick off. Minerva Punjab FC and Chennai City FC are the brand new faces in the top tier league of Indian Football and both the teams come with a lot of promise, ambition and vigor. Goan heavyweights Churchill Brothers make a comeback to the league and they will have a point to prove. The total number of teams have increased to 10 as compared to 8 last season and with so many new players coming in, it will an interesting watch. 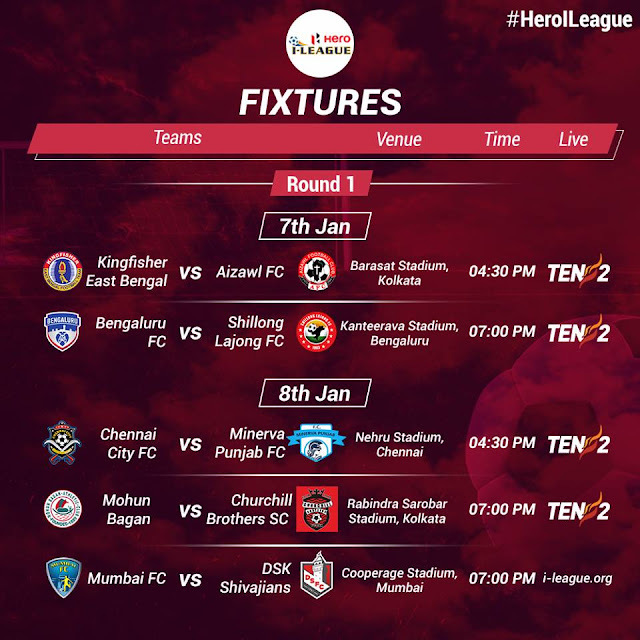 Ten will telecast the matches along with live streaming in the I-League official website. The opening day of the Hero I-League 2016-17 will see Kingfisher East Bengal taking on Aizawl FC at the Barasat Stadium, while defending Champions Bengaluru FC hosting Shillong Lajong FC at the Kanteerava Stadium.